So, what do you charge? This is always hardest question to answer. As the leading Colorado Wedding Entertainment Designer®, Wedding Master of Ceremonies & Wedding Disc Jockey, I am often approached by brides who are sometimes unable to make a commitment on their wedding because they feel they cannot afford it. Generally, this is more of an issue in failing to recognize the difference between an investment for a specific positive and memorable outcome versus a line item expense that was simply allocated for music on the wedding budget. Since this is common, I thought I would take a few minutes to help distinguish between the two. Proven systems, processes, products, etc. What do you perceive a DJ’s role to be? I know, I know, the common misconception is “don’t DJs just play music and make a few announcements?” Yes – the other Colorado DJ companies do. We don’t. We provide several comprehensive services. What is their process compared to the Amore’ Entertainment Designer™ Process?, or even their “planner” compared to our extensive “Amore’ Reception Confirmation Planning Kit” and the “Amore’ Ceremony Confirmation Planning Kit”? Bottom line: couples that hire Amore’ DJ Entertainment are looking for something beyond just music and a few announcements. Instead, Amore’ brides are looking for the professional, experienced and polished wedding MC/DJ Entertainer to create, organize, then maintain a seamless sequence of events; MC everything well; play great music ; be tastefully involved, yet deliver all of this smooth flowing and easy to do process to back it all up. Here’s the main fact to remember: your wedding MC/DJ Entertainer is the person responsible for creating the joy, the laughter, the smiles, …ultimately, the memories for you and your guests. That person, is also the face and personality of your reception; whether professional, tasteful and prepared, or drunk, sloppy and hitting on bridesmaids. Then, the DJ you entrust to your wedding, working directly with your photographer (and videographer), those special moments, joy, laughter and memories will get captured. In fact, according to Wedding MBA, the two most critical decisions a bride will make, whether she knows them or not at the time are: #1) the entertainment (the DJ she hires); #2) photography / video (the person that captures those memories). Let’s fact it, when it’s all said and done, all you have is the memories created. A fair warning though! If your Colorado wedding DJ costs less than your veggie tray at the venue, then you’ve got a problem! I know, I know, that’s not really fair, but when you think about it, the typical wedding veggie tray at $11.50 per person x 125 guests is $1,435 (plus tax and the “service fee” forced tip) for carrot sticks, broccoli, celery and a little ranch dip. Honestly though, in the end, what lasting impact will the veggie tray have on making your wedding fun and memorable? Not much. The fact is, any Colorado DJ that provides a price quote with out first taking the time to sit down and talk directly with you to understand your needs, desires, style and your budget is very unprofessional. Any reputable Colorado wedding DJ needs a lot more information beyond a wedding date, venue, and number of hours on an inquiry form. If they quote you a price, you’re just a transaction to them, and they really don’t care about you or your wedding. We care. We respect the fact that each bride, each family, each wedding has their own vision for their wedding. There are many factors that go into determining the DJ price of a Colorado wedding. 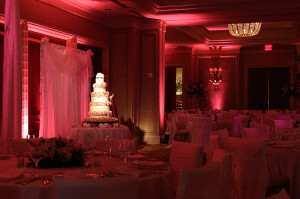 In fact, weddings at the same venue, even the same weekend performed by us, are all distinctly different by design in accordance to each bride’s individual vision for her wedding, and, by their individual nature, have different pricing based on each couple’s wedding entertainment goals, the experience they are trying to create for their guests, their tastes, wants, desires, needs and budget. • Is it in season (April 15-November 15) or out of season (November 16-April 14)? • Is it a week day (Mon-Thr) or weekend (Fri-Sun)? • What time of day? • How far is it? • When can we get in there to set up? • When do we have to be out of the venue by? • Have we played there before? • Do we have to set up extra early, or tear down super fast because the venue is double booked? • Are we doing the wedding ceremony too? • What equipment is needed for the ceremony? • Is there live music for the ceremony? • What’s needed for the reception? • What specific equipment is needed to accomplish what you really want to do, and do it most efficiently with the best equipment, the most creative way, at the least cost? • Do we need additional power, special permits or specialized equipment? • What do we actually need to do accomplish the experience you are trying to create for your guests? • Is it special audio, lighting & décor or photo booth equipment not normally in an ordinary package? • Does it take a few hours to design a small, intimate wedding or a full ceremony and reception with the 150 guests and the need for 50+ hours for our full reception entertainment planning? • What about the Amore’ Interactive Photo Booth, a custom green screen, or the “Red Carpet” treatment? • Does it require special song editing or additional studio production to enhance those special moments and truly make them memorable? (For example, Amore’ DJ Entertainment’s “Signature Audio Tribute”). As you can tell, a big part of the Amore’ Wedding Entertainment Design™ process is to ask a lot of questions so I can gather the information needed for an accurate price quote. The best part though, with our service and the 12 roles we do for weddings, there are never any hidden charges. You’ll get a complete price when we meet. You don’t pay for travel time, set up or tear down time. The price quote I give you is the price we’ll stand by…even if things happen (like a once in a 500 year flood and the drive for an Estes Park wedding suddenly now takes 3 to 4 hours each way for over 2 months with 12 weddings on the books there during that period. Unlike all the other DJs, we didn’t even think to come back to our brides and demand an adjustment to the price, adding in surprise surcharges for additional mileage, travel time and a hotel room. We do business with integrity. The price we quote, is the price we stand by). We have a range in basic package prices that range from $995 (for equipment rental only) to $2,495 with an MC and separate DJ, full club style lighting, great sound, full coordination, personalization and specific creation for those special “uniquely you” moments. 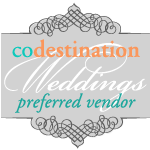 We’ve been asked to guest write a couple articles on “How to Hire a Colorado Wedding DJ” and that very topic for Colorado-Destination-Weddings.com. We also have several wedding resources to help brides hire smart, including specific questions to ask; insider secrets and more! 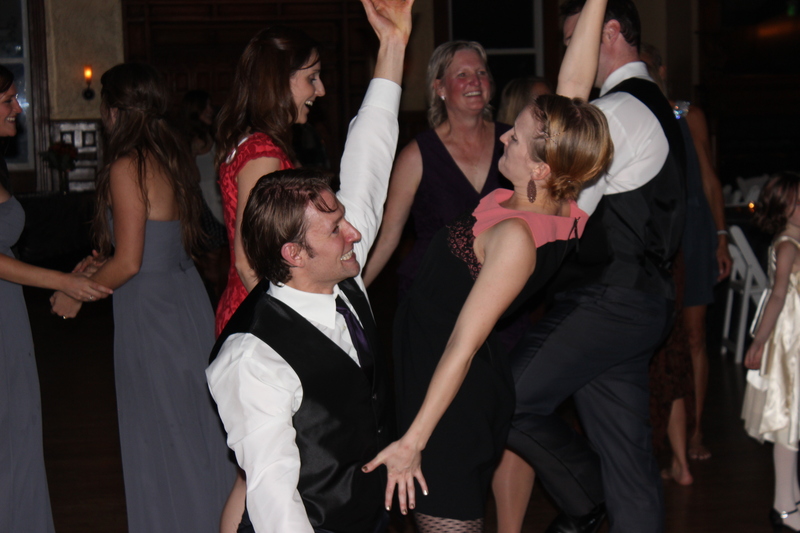 Yes, it is true that “you get what you pay for” when it comes to hiring a professional wedding MC/DJ Entertainer. In reality, the difference in the actual price between a bargain DJ and a professional wedding MC/DJ entertainer is relatively small compared to the overall cost of planning a wedding. Couples commonly spend $70 to $110 per person for food and drinks, and yet allocate a small sliver of the budget looking for the cheapest wedding DJ entertainment they can find; often times spending less than 5% of the total cost of the wedding on entertainment. According to the Knot (2011), the average US bride spent $27,800 for her wedding (honeymoon not included). The cost has been very similar in 2012, 2013, and currently. At the typical 6 hours for the ceremony and reception, that’s $4,633 per hour! Fortunately, the current average cost of a wedding in Colorado is documented to be between $20,800 for her wedding (and some are a lot more!) Most quoted “Wedding Experts” suggest that a practical bride should expect to spend 5% (as an absolute minimum) to up to 15% of her total wedding budget for QUALITY reception entertainment (with 8% to 12%) as the typical norm. Doing simple math, then brides in Colorado, and even weddings in Wyoming should expect to pay anywhere from $1,600 to $3,000 for a professional wedding MC/DJ Entertainer who you can have confidence in both them, and their process, to make your wedding a complete success. Again, your price may be more, or less, depending on the season, including the date and day of the wedding, special arrangements with certain venues, the duration of event, equipment needs, design, etc. Investing that amount of your wedding budget on your wedding MC/DJ Entertainer is a great value; especially since our past brides consistently state in post performance evaluation surveys, that we have a 90+ percent influence as to the total “why” their wedding was a total success. Liability insurance (we don’t just tell you we have it, and hope something never happens. You’ll see current proof when we meet. This is getting to be more and more important; especially now that many venues randomly require the actual DJ performing to send proof of coverage before even being allowed on the property to set up; sometimes the day before the wedding. Translation: no verifiable proof of insurance = no set up = no DJ = stressed out Bride). NOTE: it is critical to also make sure the DJ has the appropriate amounts of coverage and riders the venue requires because often different venues have different requirements. FREE travel within the Front Range (no charges for fuel, drive time, mileage, etc). Consistently serving Fort Collins to Estes Park, Colorado Springs, Denver, Boulder, Greeley, Vail and ALL across Colorado. Also willing to perform out of State by request. No hidden charges (you are only paying for performance time) even though our most common wedding package has 52 hours of documented preparation personally done by Matt for each and every wedding before we even arrive! A FULL set backup gear (on site) and available back up DJs. Have we ever used it? NO – because we are meticulous on maintenance. However, there’s always a chance something could happen. So, we will have a complete set of gear there, on site, just in case. Including: all chords, fuses, amp, mixer, speaker, microphones, equipment stands, special connectors, computer, music, and more. (Not just a “back up plan” like the other DJs do because if the music stops and your DJ has to call for back up equipment, your reception is over. Think of it this way: Imagine another company’s DJ calling his wife on a weekend and she’s out shopping at Macy’s, then trying to explain what piece of gear to find in the garage. Meanwhile, back at the reception as guests are leaving, everyone waits for her to get to home, find it, then drive to the wedding arriving two hours later. Really?!? Yes, and very typical from many stories we’ve heard about all the other DJs from venues and caterers. The last thing you need to know about hiring a professional MC/DJ Entertainer is how to make sure they are who they say they are and that they have the ability (process) to deliver what they say they can. We have both! Take a look and read more about our “Wedding Entertainment Design™” process. You’ll love it! The second best way to determine the reputability of your DJ is to look at references. We have a stack literally eight to ten inches tall! Lastly, stay away from any DJs who will allow you to check up on them at someone else’s wedding. First of all, it’s VERY unprofessional to invite strangers at another bride’s private reception. Really?!? Yes, in fact some DJs boast about ding that! Secondly, if a DJ is willing to be distracted as someone else’s wedding, he will likely engage in other unprofessional (and tacky) behavior at your wedding. Honestly, do you want him to be distracted at your wedding by doing the same thing and inviting strangers in to your wedding? Probably not. Plus, you will never get a complete picture of their true ability by spending 5 to 10 minutes in the corner of a 6 hour wedding. What if that couple wants 90% country music, and you truly dislike country music? That 10 minutes not only skews things, but more importantly, it’s about those things you really don’t see that matter most, such as: Was he on time? Was he well prepared? Was he organized? Etc. We make weddings unique and personal! I would love to hear more about your vision for your day and get you a wedding price quote.